Dr Prahalathan, Bhumi’s co-founder shared some insights on why mobilising and retaining support from Corporate Social Responsibility (CSR) is essential for running our programmes. Section 135 of Companies Act, 2013 makes “CSR spend of 2% of average net profits … during the three immediately preceding financial years” mandatory, and under Schedule VII programmes that promote education and ensure environmental sustainability are eligible. Build credibility: what can be a better testimonial than an employee pitching a non-profit that he/she volunteers with? Be consistent: a corporate saying no this year does not mean it’s a no forever! Continue to invite them for events, and share quarterly updates. Stay in touch, for when they are looking to add partners, they are likely to remember you! Co-create: avoid judging a corporate by its size. It’s easier to connect and grow with smaller companies. Convert: be open to exploring any kind of partnership. 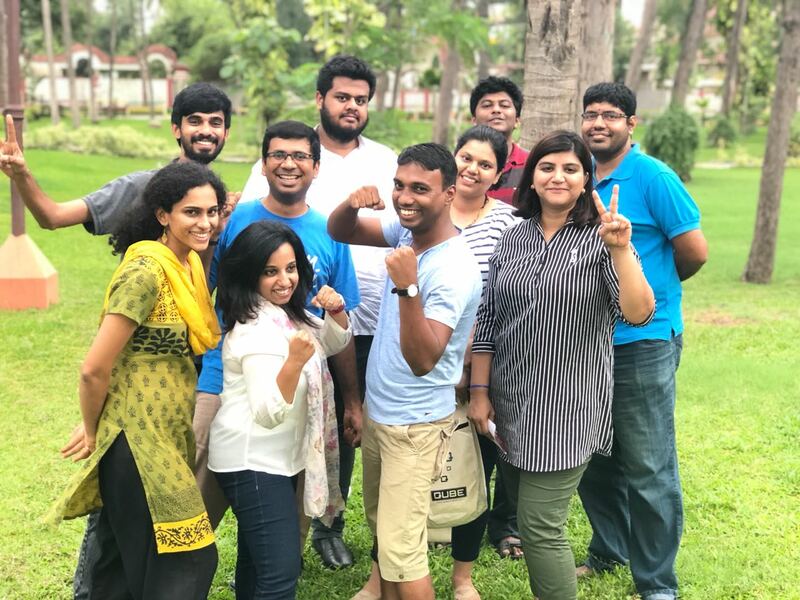 Engage the employees in volunteering with Bhumi, and the management is likely to invest in the cause a few months/a year later. Plan for contingencies: “do not put all eggs in one basket” because you have little control over some decisions the company’s board is likely to make. Try for multiple opportunities. Take your first step now! Write to devteam@bhumi.ngo to explore partnerships with the corporate you work for. Archana Hari who currently heads Online Giving & Subscriptions at Give India spoke to us on how monthly giving is essential to build a sustainable organisation. Her key responsibility at Give India is to understand the giver’s mindset and build solutions to grow the tribe of committed donors across the world. Small contributions add up to make a big difference! Start by signing up to give monthly – much like crowdfunding, you must be the first contributor! Reminding the donor or expecting the donor to remember to give monthly is not a concern! Our National Automated Clearing House (NACH) will ensure this is done automatically at the beginning of every month for a duration committed by the donor. Write to reach@bhumi.ngo for further details. Although there is no dearth of schools in the country, the quality of education is questionable for a recent survey showed that only 48% of children in class 8 can solve a simple mathematical division. This gap in learning levels makes Bhumi’s work essential. Bhumi is a non-profit organisation that educates 25,000 underprivileged children across India. Our programme at orphanages is implemented by young volunteers who have the passion to drive social change and the commitment to teach. A preliminary assessment helps us understand the current skills level and create content specific to the child’s needs. Volunteers then gather at the shelter home every weekend to deliver an activity-based education programme. The results of our consistent effort showed 30% increase in the learning outcomes of the children last year. Bhumi engages 20,000 volunteers across the country and our work would not be possible without the support of individuals who donate for our children’s education. Donate Rs.500/- annually to help educate a child through Bhumi. Center your story on a single character. Does your story contain a compelling character who is relatable to your audience? Studies show this approach is more likely to inspire support. Try centering your story on someone Bhumi has served and avoid making your organization the hero. Hook your audience as soon as possible. Does your story capture the audience’s attention as quickly as possible? Give your audience a sense of what’s at stake right away. Does your story chronicle something that happened? The most memorable stories document a character’s experience, journey, transformation, or discovery. Does your story show—rather than tell—the audience about your character’s transformation? Use rich details, eliminate jargon, and feature the character’s own voice whenever possible. Does your story illustrate the emotions associated with your character’s transformation? Remember, emotions move people to act. Include a clear call to action. Does your story include a clear pathway to action—to make a donation, share on social media, or visit a web page for example? So why wait? Get started with creating your campaign on LetzChange. Here’s how. Did you know that LetzChange is one of the very few platforms that retains no fee on donations made? That’s right. What an individual donates comes in full to the cause! And that’s not the only reason why we at Bhumi have been creating our campaigns on LetzChange over the last few years! The interface is simple yet complete – from being able to create personalised campaigns to reach out to your family and friends via email and social media to automatically generated post-donation ‘thank-you’ emails & 80G tax exemption receipts, LetzChange is a beautiful package that every fundraiser looks for. So, why wait? Here are some simple steps to create your campaign! 4. Catalyse teams in some cities. What’s happening in other chapters? 5. Discuss What’s happening in Ignite shelter homes centres? The Bhumi Support Team and its people have collectively managed the Ignite – Shelters programme since inception, till date but times have changed. What will the Bhumi Support Team – BST do? Serving as external advocates – Representing the programme to funders etc. The table below gives a brief over-view of all documents we maintain and respective owners of the same. Click here to view the complete documentation ownership breakdown. Buddy4Study, since 2011, is endeavouring to bridge the gap between scholarship providers and scholarship seekers. As India’s largest scholarship listing portal, they help more than 1 million students by connecting the right scholarships with the right students. Backed by its robust scholarship search engine, it is the only platform in the country that allows both seekers and scholarship providers to access curated scholarship information across the globe. India’s largest scholarship network with the vision to make quality education accessible for all. A brainchild of IMT, IIM, and BITS Pilani alumni, Buddy4Study aggregates global scholarship information. L’Oréal India For Young Women in Science Scholarship 2018? L’Oréal India For Young Women in Science Scholarship 2018 invites applications from young women who have passed class 12 in 2018, with a minimum of 85% marks in PCB/PCM. The scholarship is granted to promising but economically disadvantaged young women and covers college fees for study in any scientific field in a recognized college or university in India. Who is offering this scholarship ? The scholarship is being offered by L’Oréal India with an objective to support and encourage young women to pursue careers in Science. The programme was instituted in 2003 and has consistently helped young women to pursue scientific studies. Who can apply for this scholarship ? How can you apply ? The application can be done online or by post. Online: Register on this link with Gmail/Facebook account and fill the 5-step form. Stellar IT Park C-25, No.8,9 & 10 Tower – I, Ground floor, Sector 62, Noida, Uttar Pradesh 201301. Read further about the scholarship here. The scholarship is being offered by Legrand India under the scholarship program “UGAM – Legrand Scholarship Program 2018-19”, with an objective to help girl students to pursue higher education in India. The application can be done online. Step 1: Click here to register by Gmail, Facebook or any email ID. Step 2: Fill the 5-step form. Step 3: Provide personal details, academic details, reference details etc. Step 4: The candidates have to answer three descriptive questions in about 600 words describing themselves, why they have decided to pursue the chosen course of study, how the scholarship will help them and what are their future plans, explain why they are a worthy candidate for this scholarship? Step 5: Submit the completed application form.